Considering a Green Roof System? But not sure whether to install a sedum or wildflower system? It is a common question for anyone investigating green roof systems. Both types of green roof have pros and cons…so which one should you choose? Both sedum and wildflower (Bio diverse) roofs require maintenance. 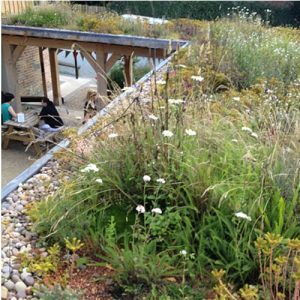 However a wildflower roof will require much more maintenance due to their large variety of plants and the types of plants used. Whereas sedum are very low maintenance and rather hardy. Wildlfower roofs require more feeding, irregation and are more labour intensive. Sedum is a hard wearing and draught tolerant plant which offers colour all year round. Sedum is aesthetically pleasing, as is wildlfower roofs. Wildlfower roofs offer a more varied mix of plant species and local wildflower plants can be incorporated into a wildlfower green roof to enkeep with the surroundings. when fully saturated. 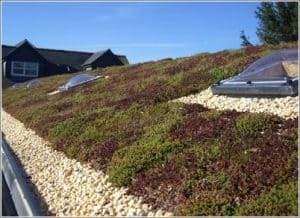 A green roof with a weight of 30kilo per m2 generally consists of just sedum whilst a wildflower / bio diverse roof can weigh upto 220 kilo per m2. Both sedum and wildflower roofs provide much need habitats and food sources for wildlife and insects. 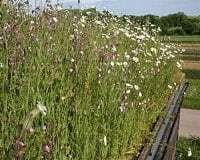 However wildflower roofs can attract a wider variety of wildlife including bees.